A piece of pan-seared ayu (sweetfish) fillet arrives, its skin crisp and lightly browned. One small bite and its golden exterior easily breaks apart, revealing the prized white meat within. A seasonal special from Shizuoka, the fish is seared on an induction cooker in the kitchen, at a temperature that is adjusted to the fillet’s size. Too high a temperature, and the crust will end up charred, imparting an overwhelming smokiness that may overpower the sweetness of the fish. Too low, and it won’t crisp up the way it should for that satisfying crunch. It’s only a piece of fish, and an unassuming looking one at that. But make no mistake, there’s nothing ordinary about the food at Waku Ghin, a two-Michelin-starred restaurant at Marina Bay Sands. Every dish has been carefully conceptualised and fine-tuned to perfection using only the most precise techniques, and paired with the finest ingredients. Our ayu, for instance, came perched on a small bed of pomelo pulp, diced daikon and fennel bursting with tangy flavours, and accompanied with a smear of green sauce made from water peppers that grow near the river where the fish was caught. The ayu was only a prelude of more fascinating things to come, as we would later find out during our visit. The mention of Waku Ghin is likely to elicit any one of these responses: Reverent awe from the blessed ones who’ve tried its pièce de résistance of marinated botan ebi with uni; a passionate speech from those who believe it should have received two Michelin stars all along (the restaurant was awarded one star in 2016, to the chagrin of those who felt it deserved better); and enthusiasm from fans of its chef Tetsuya Wakuda. 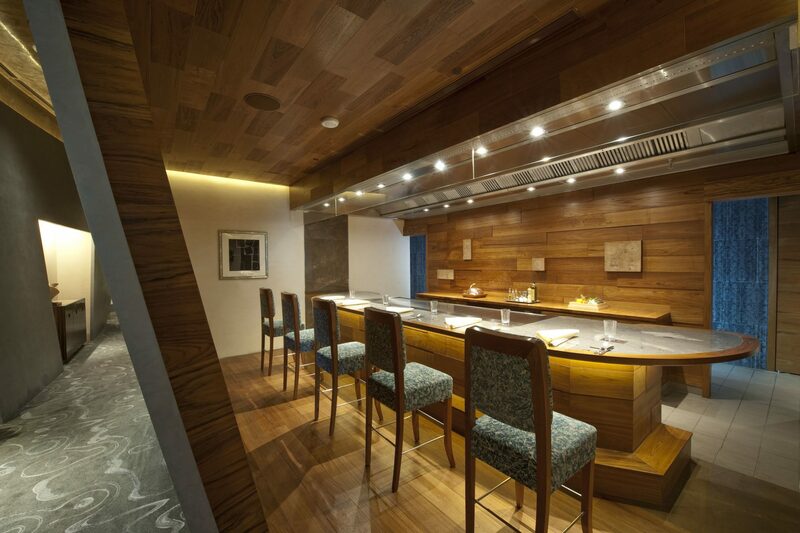 Opened in 2010, the restaurant is known as one of the top fine dining establishments in Singapore, and has been lauded worldwide for its contemporary Japanese-European cuisine, presented in a 10-course degustation menu. 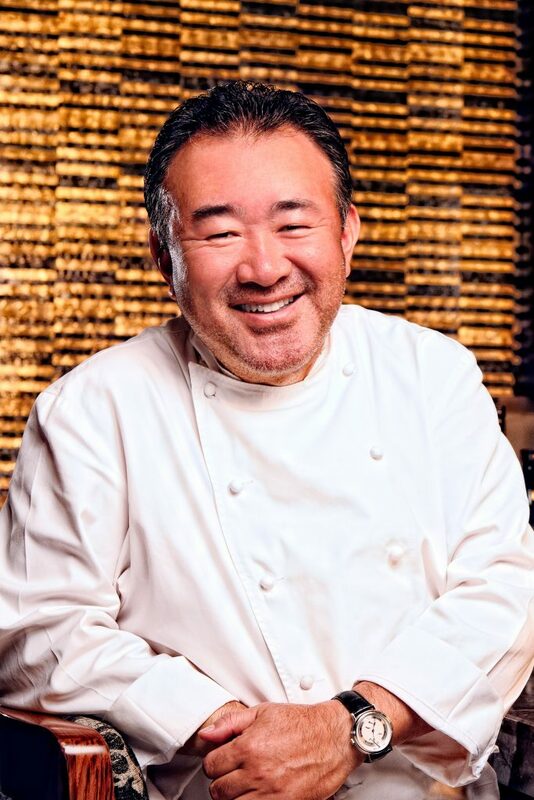 It also has a glamorous reputation thanks to chef Tetsuya, a renowned culinary veteran who helms the celebrated Tetsuya’s in Sydney, and its high-profile guests the likes of former soccer star David Beckham. Chef Tetsuya Wakuda, Waku Ghin’s owner. Tucked away on a floor that houses several other restaurants, Waku Ghin looks almost austere and intimidating with its heavy frosted glass doors — which offer privacy to diners within. But step inside and you’ll be proven wrong. 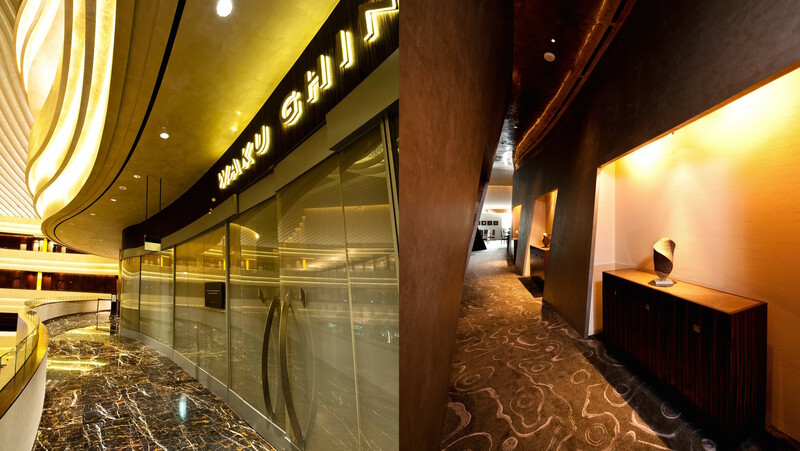 Attentive and friendly staff greet you warmly upon entry, before ushering you to take a seat at the bar area. Walk-in customers are welcome to dine at the bar, which serves a separate menu of bar bites and cocktails. But what you’re really here for is the full Waku Ghin restaurant experience. Prior reservations have to be made, as there are only two seatings (5:30pm and 8pm) daily. When it’s time, guests are led to four dining rooms, each seating up to six customers, and equipped with a custom-built grill. Dinner begins with the chef bringing out a box overflowing with seafood that will be used in the meal. The seafood is sourced from a Shizuoka supplier and delivered twice a week to the restaurant. At our session, executive chef Masahiko Inoue presented a treasure trove of botan shrimp and lobsters from Canada, uni from Hokkaido, and abalone from Tasmania. Everything was so fresh, the lobsters and abalone were still alive. Waku Ghin’s dishes are dependent on what’s seasonally available, so save for a few signature items, its menu isn’t fixed. Waku Ghin’s entrance (left) and interior (right). We started off with a toro carpaccio dressed in soy and mirin. Prepared in the kitchen, the Shizuoka tuna belly had a delectably buttery texture and was topped with crunchy and bitter chunks of endives. Like the ayu, it was a relatively straightforward dish. But what caught our attention was the way the tuna had been deftly sliced to avoid its sinewy parts, yielding silky smooth, fatty slivers of fish. These tuna pieces were then gracefully folded — almost like petals of a flower — so only parts of it were soaked in the soy dressing, allowing some of its natural flavour to come through. Next up was the highly-anticipated crown jewel of Waku Ghin’s repertoire: A sea urchin shell containing tongues of uni, and botan shrimp marinated in soy, mirin and dashi. A generous dollop of Oscietra caviar is set on top to kick the indulgence level up a notch. This whole concoction is presented on a bed of crushed ice with a mother-of-pearl spoon — the only utensil you’re permitted to eat it with, because a regular spoon would taint the flavour of the caviar with its metallic taste. 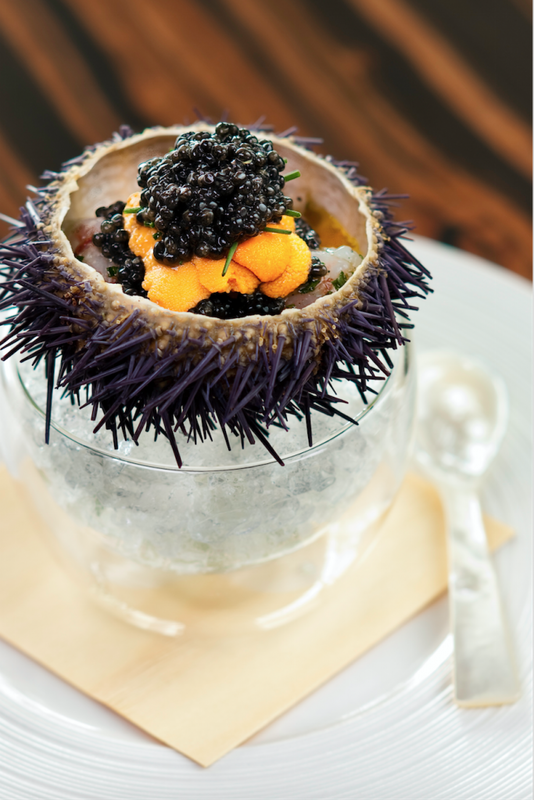 Every spoonful is heaven in a mouthful, with the delicate brininess of the uni mingling with the sweetness of the shrimp, and the caviar pearls providing pops of saltiness. Deliciousness aside, this dish is also testament to chef Tetsuya’s meticulous sourcing of ingredients. The caviar is sourced from a French company that operates an Oscietra sturgeon farm in Asia, and its texture, size and saltiness are all tailored to Tetsuya’s preferences. Waku Ghin’s crown jewel: Marinated botan shrimp with sea urchin and Oscietra caviar, presented in a sea urchin shell with a mother-of-pearl spoon. Every pearl is perfectly firm, without the slightest hint of mushiness, and bursts gently on the tongue without chewing. It’s also a little larger and plumper in size compared to that of its ilk, packing a greater umami punch. Even its saltiness level has been adjusted to Tetsuya’s requirements: Salty, but not so cloying or fishy it overpowers the flavours of the ingredients. Needless to say, we were sad when we lapped up the last bites of this dish. But what came next didn’t disappoint either: Succulent Hokkaido king crab legs steamed on the grill before our eyes, and drizzled with an aromatic lemon-scented extra virgin olive oil. Much painstaking effort goes into its preparation. A mixture of oil and sea salt is first poured onto the grill, before being shaped into a dome-like mound. The crab legs are then placed on top, sheathed with a bamboo leaf, and covered with a lid for about two minutes. The grill temperature is set at around 220 degrees Celsius, and the salt bed absorbs the steam so the crab is cooked on its own. When the lid is removed, the crab meat is so tender it can be easily extracted from its shell without trouble. A blend of Shodoshima extra virgin olive oil with lemon juice and pepper is poured over it, along with a dash of grated lime. The result is sweet, juicy crab flesh imbued with bright, zesty flavours from the citrus. Another dish that epitomises Tetsuya’s steadfast attention to precision is the abalone with white asparagus and butter sauce. The abalone is first seasoned simply with salt and pepper, before being placed on the grill. At our dinner, the grill was set to 180 degrees Celsius. Chef Masa watched the abalones closely, pressing them down and flipping them to ensure they were evenly cooked and left with a gorgeous brown char on their surface. At times, he shifted the abalones to a new spot so they wouldn’t stick to the hot counter and be ruined when removed. When the abalone is ready to be served, it’s dipped in a sauce composed of butter, bonito stock, grapeseed oil, Italian anchovies, ginger and garlic; sliced into strips, and bedecked with white and wild asparagus. The whole combination tastes divine, with the juxtaposition of textures in the chewy abalone and crunchy asparagus, and the creamy, moreish sauce enveloping every bite. 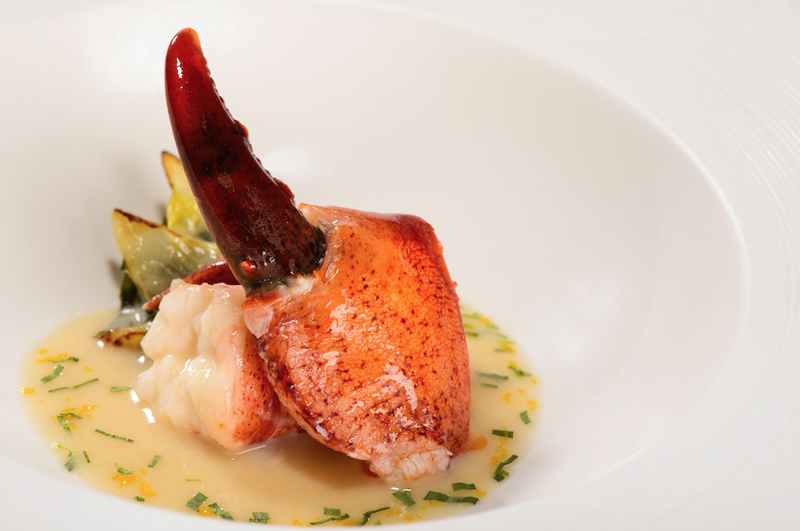 The braised Canadian lobster undergoes an elaborate preparation process. Equally time-consuming to prepare is the braised lobster dish, where the crustacean’s claws are cooked in a bisque comprising roasted botan ebi head, celery, carrot, onion and tomato paste that’s been simmered for 20 hours beforehand. Preserved lemon, butter, ground pepper, fresh tarragon and olive oil are added to the lobster, perfuming it with a glorious fragrance. This delectable hodgepodge of ingredients is then served with wakame seaweed, crisp bread chunks and an aioli-based paprika cream. The lobster meat is juicy and sweet, and the broth it’s drenched in is so rich and laden with umami, you’ll find yourself mopping up every last drop with its accompanying freshly-baked bread roll. A dish we found particularly memorable was the grilled Ohmi A5 wagyu steak, which was complemented with garlic chips, spring onions, freshly grated wasabi and Okahijiki, a type of seaweed. The well-marbled sirloin was seasoned only with salt and pepper, and made for a scrumptious treat when savoured with ponzu sauce. But what really elevated the flavours of the steak was the wasabi, thanks to its fastidious grating process. It’s rubbed against a customised grater in a circular motion, in order to obtain a creamier texture and a milder, less pungent flavour. Using a regular metal grater will cause the wasabi to oxidise more quickly, leading to a sharper and spicier taste (which may overwhelm the flavours of the dish it’s used in), while employing a linear up-and-down movement tends to exert too much pressure on the wasabi and tear its fibres unevenly. This precise method produces wasabi that contributes only a fleeting, subtle burn that doesn’t shock or linger on the palate. So go ahead, slather on a liberal amount when you’re devouring the steak. 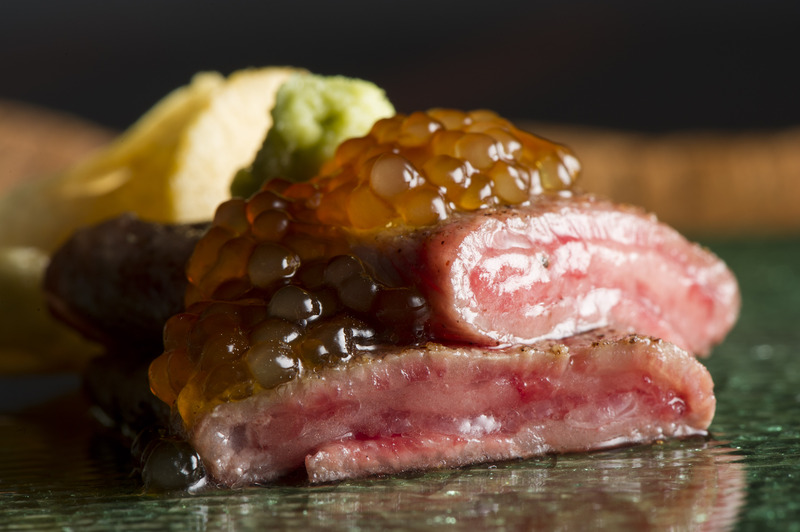 Another version of Waku Ghin’s grilled Ohmi beef with freshly grated wasabi, this time served with ikura pearls. As the evening drew to a close, we moved to Waku Ghin’s main dining room, where we wrapped up our dinner with a final savoury course of piping hot chicken consommé with snapper and steamed rice — a clean-tasting and comforting broth spritzed up with yuzu. This was followed by desserts of Japanese musk melon with Cointreau granita and a fromage blanc (white cheese) sorbet, and wild strawberries sitting in orange blossom honey cream. Lounging in our chairs as we watched Spectra, the outdoor light and water show through the floor-to-ceiling windows, we felt like we were in a private sanctuary of our own — one replete with excellent food, and equally impressive culinary techniques that make the restaurant absolutely worth the visit. To enjoy a complimentary welcome drink when you next dine at Waku Ghin, simply quote “LSA” when making your reservation. This is valid until 31 August 2018, and is not applicable to The Bar. Waku Ghin opens from Monday to Sunday.